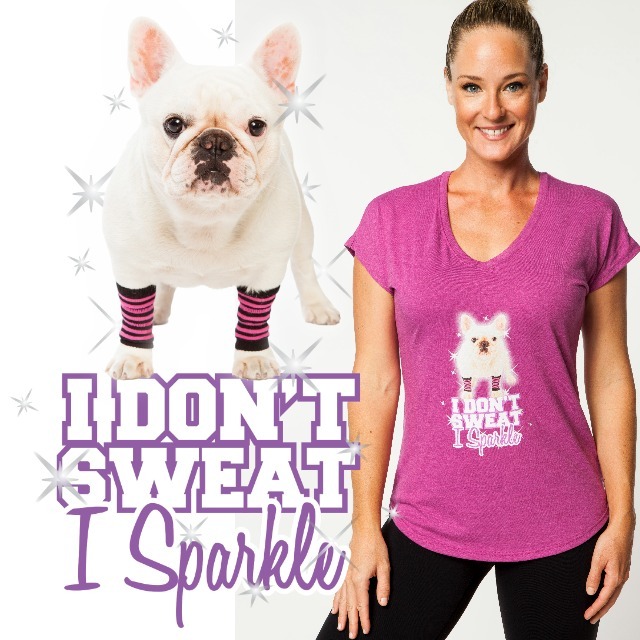 French bulldogs + Fitness.. Our T-Shirt is Here! It’s a v-neck tee, which makes it super versatile – you can wear it for a workout or while running errands (if you don’t mind Peanut’s face on your front, haha!). The shirt is made of a poly/cotton/rayon mix that is super comfortable and allows for a flattering fit – not too loose but not too tight either. The shirt also features wider cut sleeves and a curved bottom hem with durable side seam construction, plus the design is imprinted digitally for greater durability. It’s available in women’s S-XXL sizes and in four fun colors. A portion of the t-shirt sales proceeds go directly back into helping to fund all of our free YouTube Channel videos (upgrading equipment, editing, music licensing, etc), making this a fun way to help support our team. If you order one, please share of pic of you in it with us on social media (don’t forget to tag us @JESSICASMITHTV)! Thank you for all of your support #JSTVFit Team! We couldn’t do this without you! Can I buy the t shirts in the UK please? I love you Jessica and Peanut! The ordering is still very slow and seems they have sold out of everything above size Large! I hope a large will fit! Also, for further tees I like the phrase Sweat Is Your Fat Crying & If you Look Good After A workout You Didn’t do It Right! Could have Peanut laying on her back for that one! I look forward to seeing if it fits and posing for a pic for social media! Hi Melissa! Thanks for checking out our t-shirt! The shirt is available is sizes S-XL and they do not sell out as they are printed on demand, so you can select any size within that range you’d like to order 🙂 Hope that helps and thanks for your support! Can’t wait to get mine but the link does not go to an order form. Maybe there’s a problem on my end but I wanted to let you know. Thanks!